I am buried in work (and I am slowly crawling back up). All the last-minute projects made me lose the motivation to go to the World Street Food Congress which happened from 31 May to 9 June. However I saw a lot of sad pictures where there was hardly anyone visiting the stalls. I felt bad and guilty for the vendors especially the ones who flew all the way to Singapore. To show my support and hoping that these overseas vendors will return, I went with my fellow tam chiak (translate: greedy) friend, Kat. We went on a Friday evening. When we reached the venue, it was almost deserted. We did a tour of all the food stalls and target the ones we wanted to try. Some were really outstanding while others were pretty ordinary. The first stall that I visited was the famed La Guerrerense from Mexico. I ordered the seafood tostada with a mild sauce (S$10). While I was waiting for Sabina, the owner to fix up the tostada, she was also busy chatting with customers. And she would suddenly stop whatever she was doing, whipped out her handphone and take a snapshot with her customers. She was so adorable! And her seafood tostada was one of my favourites for that evening. 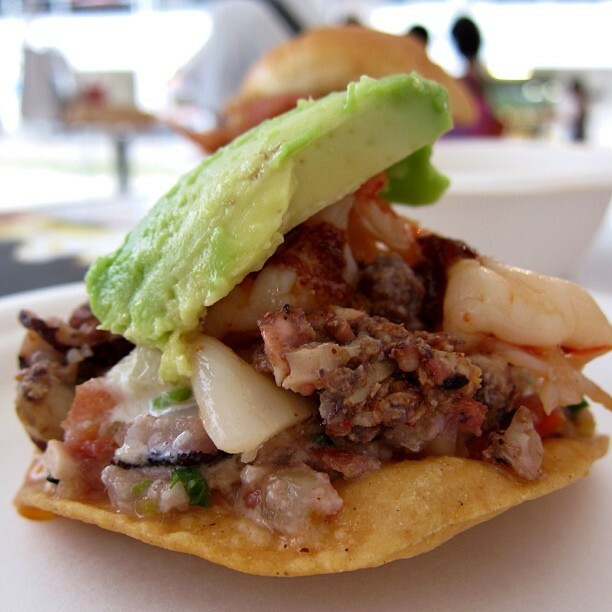 The base of the tostada was lathered with some sort of crab paste and Sabina would stack chunks of prawns, squids and top with a big slate of avocado. You got to choose the spice level for the sauce and I opted for mild. 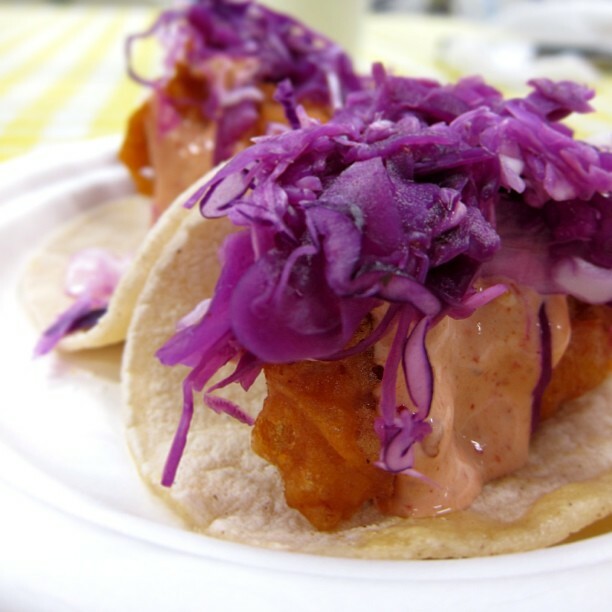 When I bit into the tostada, you get the crunch from tostada, the seafood was fresh and everything was well-balanced. 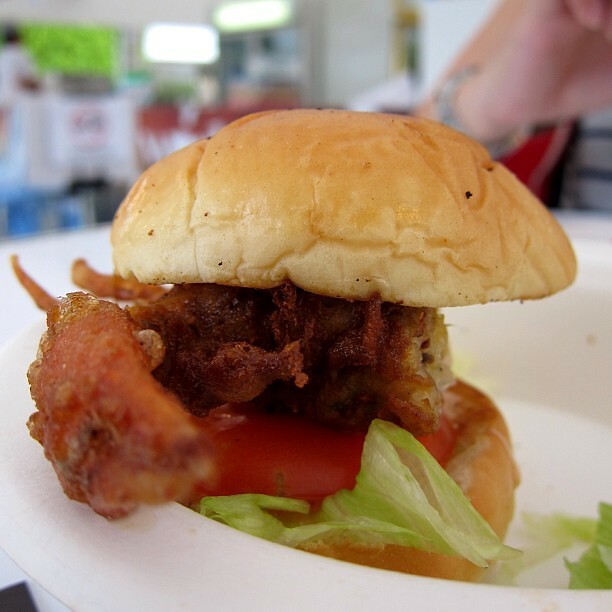 Kat and I shared a soft shell crab burger (S$10) from Eurotrash Food Cart. It was pretty ordinary and I did wish the crab was more crispy. Once we were done with the first round of food, we were off to get more food. I went off to The Swamp Shack and got us shrimps and grits and smothered chicken. 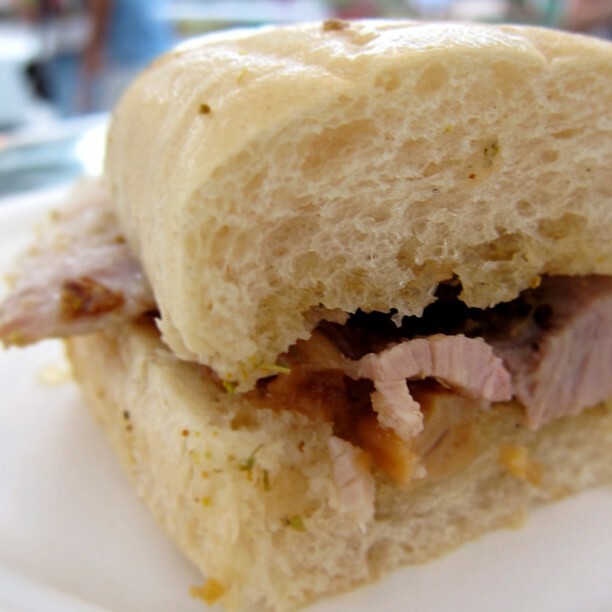 Kat went to get a porchetta sandwich from The People’s Pig and chicken 65 from Abhishek. 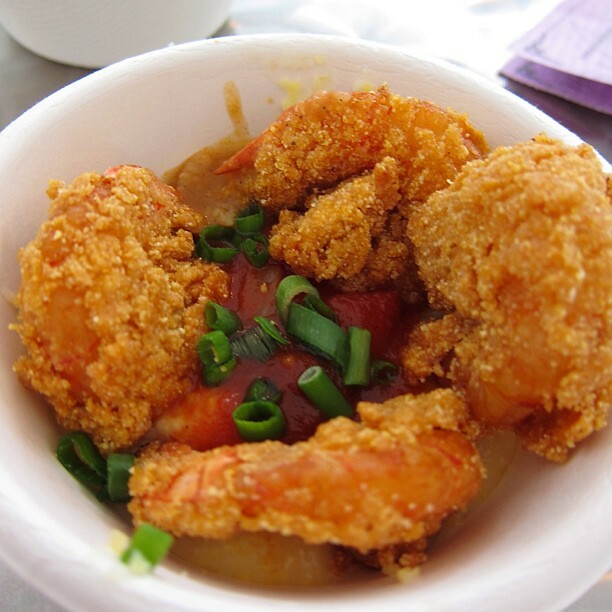 The shrimps and grits (S$10) was pretty decent. The shrimps had a cornmeal crust which was seasoned with chilli as they were quite spicy. I actually quite enjoyed the grits, it was buttery and well-seasoned. The smothered chicken (S$9) faired a lot better. 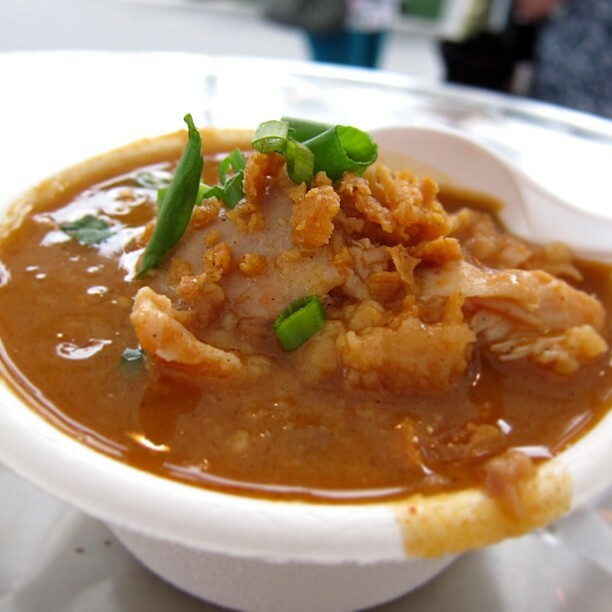 Fried chicken, mash and gravy – how not to love? Though the chicken got a bit soggy from the gravy, it was quite a generous portion. The mash potatoes and the gravy stole my heart – it was smooth and buttery, and I love butter. I didn’t have a taste of Kat’s porchetta sandwich (S$9) but she said it was quite nice as it had fats (I think you can tell we are not fans of low-fat food). The chicken 65 (S$3.50) was surprisingly delicious too. At this stage, we were stuffed. We each got a drink and sat in the indoor dining area and enjoyed the breeze. After a while, I craved for the tortilla chips and guacamole that I spotted earlier. Unfortunately they were sold out. So I got the fish and beef tacos from Tacombi. The first bite brought me back to the Maxwell Street Market in Chicago. I could taste the masa harina in the tortilla, and the fish and beef were beautifully fried. What surprised me was the pickled cabbage. I was never a fan of purple cabbage but they were skilfully prepped that you do not taste the rawness in the cabbage and not too acidic too. A wonderful end for me. Despite all the delicious food that I have ate at the World Street Food Congress, there were a lot of problems too. And I will not go into details as I know how difficult it is to organise such events (this one took two years to plan). But one thing I do hope that the organisers look into is the price point. I be honest here, the food I chose to eat are mostly from the North America. I purposely skipped the stalls from Vietnam, Indonesia, China and so on. Yes it may sound silly as I might miss out on some great cuisines. But I just can’t do it. As someone who travelled around Asia quite often, I know the cost of food and they were not exactly out of reach. So I will not pay S$8 for a small bowl of mee siam. I do know there is logistic and business cost involved. But to a consumer, these are factors that we do not consider. 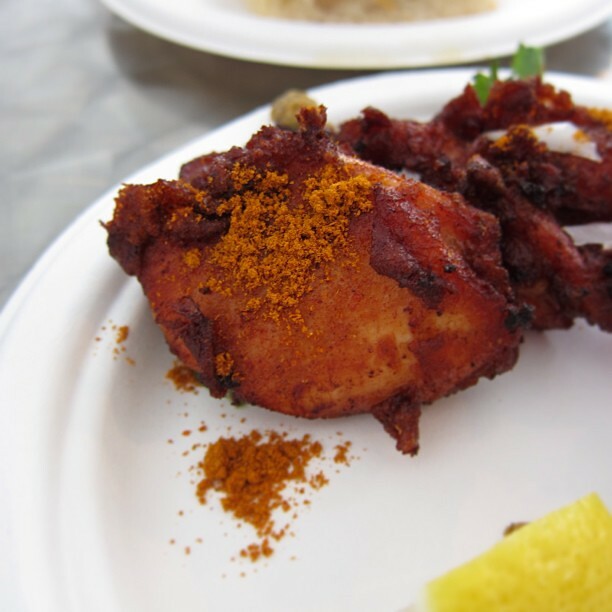 We just think it is street food and it is supposed to cheap. Especially in Singapore, where we have hawker stalls, we are spoilt. To pay S$8-S$10 for a small portion of food, it was a bit hard to swallow. 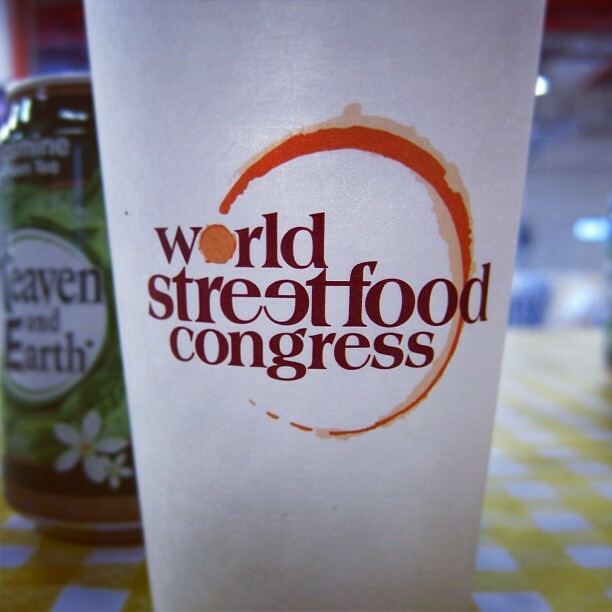 That said, if World Street Food Congress is to return next year, I will still continue to support the event.